Memorials: Ideal Park CRC Mission Fund. 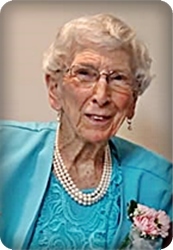 After 91 years of living consistently before her family, her friends, and her Lord, Margaret Rozeboom Brock made a peaceful transition from her earthly home to her heavenly home on Saturday, April 13, 2019. Marge enjoyed many activities including making knitted, crocheted and hand-sewn articles; cooking and baking; and camping with her family. She was known to many as a prayer warrior, praying for each member of her family daily. She grew up in northwest Iowa and moved to Cutlerville in 1945 to take nurses’ training at Pine Rest Christian Hospital where she then worked for 35 years, caring for children and adolescents. She was an active charter member at Ideal Park Christian Reformed Church, leading the prayer ministry and volunteering in many activities, and was a mentor to many prisoners at Crossroads Prison Ministries. Marge was preceded in death by her parents, Tony and Jennie Rozeboom; an infant son, David, and infant daughter, Dorothy; as well as her husband of 60 years, Sydney Brock. Marge was loved and will be deeply missed by her children, Sheryl (Don) Van Eck, Ken (Katherine) Brock, and Roger (Kathy) Brock; her grandchildren, Laura Van Eck, Brian (Leighsa) Van Eck, Becca (Martin) De Jong, Jon (Julienne) Brock, David (Allie) Brock, Aaron (Alex) Brock, and Rachel (Marcus) Wondergem; great grandsons, Benjamin Van Eck, Arlo Brock and Nolan Brock; sisters, Wilma Tiemeyer, Arlene Bidwell and Marilyn (Lee) Vander Esch; sisters-in-law and brothers-in-law, Donna Rozeboom, Jim Brock, Cyrus Brock and Genevie (Howard) Meekhof; many nieces and nephews; and special friends, Lee, Lili, Carolina and Lucas Marvin. The expresses special thanks to the staff of Sunset Assisted Living and Faith Hospice for their loving and compassionate care. The family will receive relatives and friends on Friday, May 3, from 2-4 and 6-8 pm at Stroo Funeral Home. The service to celebrate her life will be held at 11 am on Saturday, May 4, at Ideal Park Christian Reformed Church, 320 56th St. SW, with Pastors Henry Admiraal and Mark Minegar officiating. Interment at Winchester Cemetery. In memory of Marge and in lieu of flowers, memorial gifts may be made to Ideal Park CRC Mission Fund.